Umi advised to get Jeli Gamat and Hubby tried to look at Guardian and Watsons but none are sold there. So we went out last night to Giant Seri Kembangan and notice there's kiosk selling those jamu, beauty product and what not. We suspected they must have Jeli Gamat and they are! Not sure how true this product works but for the sake of easing Umie's worry-ness, so beli jelah. Hubby googled the price and it's RM54 which is truelah price tag tu but we bought it for RM50. 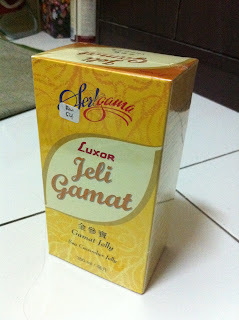 I think we can get even cheaper but tak study the real price of gamat so thats the best we can get. It works! Or at least I thot so. Makan tau!!! Sampai habis and it tastes nice kan?